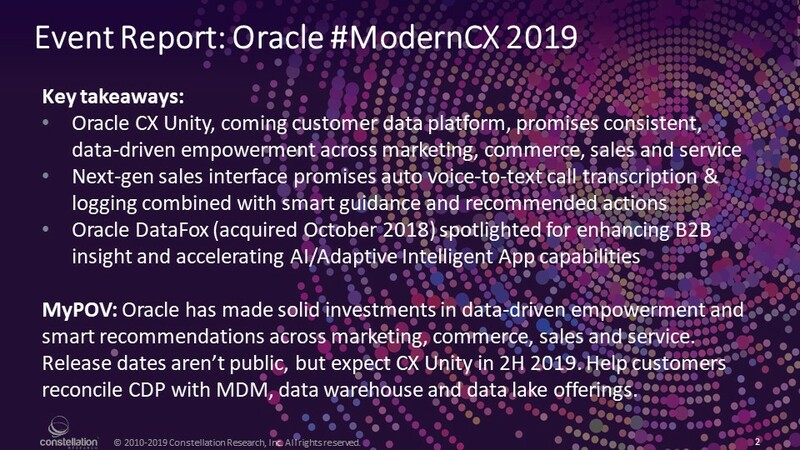 Oracle Modern CX Spotlights Customer Data Platform, AI Accelerator | Constellation Research Inc.
Oracle previews CX Unity, 'next-gen' sales UI, and DataFox upgrades. The investments are promising, but don't dismiss data lakes so easily. CX Unity is Oracle’s entry into the emerging customer data platform (CDP) market, a category first defined in 2013 and that gave rise to The Customer Data Platform Institute (CDPI) in 2016. Search through CDPI’s directory and you won’t find any big tech vendors -- just pioneers and startups mostly emerging from the marketing technology space. That’s about to change, with both Oracle and, on March 25, Salesforce, announcing their intention to offer CDPs. And it’s a safe bet that Adobe won’t be far behind on March 26, Adobe followed suit, announcing its own CDP, building on last year's announcement of a joint initiative with Microsoft and SAP to work together on an open customer data standard. As defined by CDPI, a CDP is "packaged software that creates a persistent, unified customer database that is accessible to other systems." The platform benefits marketers because it “allows a faster, more efficient solution than general purpose technologies that try to solve many problems at once.” The need for CDPs emerged as marketers started pursuing mass personalization at scale, and it’s only getting more intense as customers expect you know them and their most recent dealings with your company in real time. Attendees heard lots of promises about the advantages that CX Unity will bring. Oracle has announced availability for CX Unity by late summer. It’s only natural for Oracle to deliver a CDP, but unlike marketing-only vendors, it has a duty to reconcile this offering with the company’s MDM, data warehouse and data lake offerings (as I discuss below). As for the “next-generation” sales experience demonstrated at Modern CX, the description made it clear that it was an early vision statement -- so not something I would expect to see in 2019. The demo combined automated voice-to-text call transcription/logging and contextual, AI-based recommendation capabilities. I've seen similar capabilities both from Oracle partners, like the OppSource Sales Engagement app, which is integrated with the Oracle Sales Cloud, and from Oracle rivals (like Salesforce Einstein Voice, now in pilot release). DataFox was clearly a good acquisition for Oracle, and I particularly like the “human-in-the-loop” (Mechanical-Turk-like) training and exception-handling capabilities. The next-gen sales demo struck me as a “we’re working on it” trail balloon, but if it makes it to market in 2019, Oracle will be among the fast followers on AI-augmented sales. 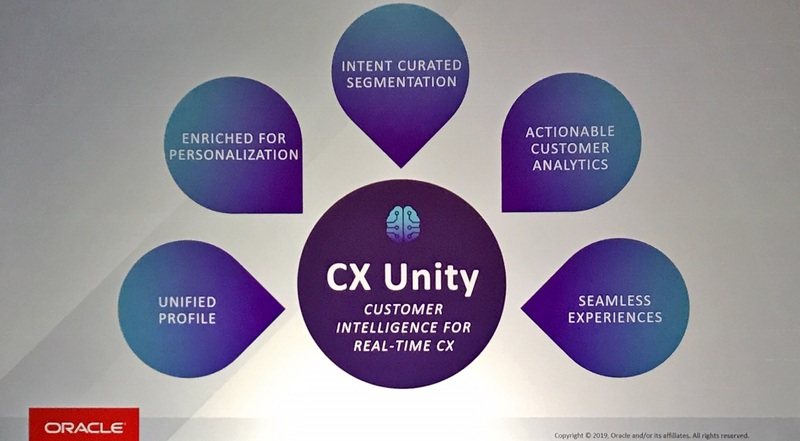 At the center of Modern CX was CX Unity, which executives described as “three years in the making.” I’m hoping for conversations with early beta customers by Oracle Open World in September. I have to admit, it has to be more challenging for a vendor like Oracle to jump into the CDP market. Unlike marketing-only vendors, I would think Oracle will be held to a higher standard to reconcile its CDP with its master data management (MDM), data warehouse and data lake offerings. I asked one Oracle exec about how CDPs and customer MDM will coexist, and he described them as complimentary, which they should be. But he went on to largely dismiss MDM as only relevant in a legal-liability context, resolving identities for ERP transaction purposes. In my view that underplays the value of MDM and you’ll want your steward-resolved customer MDM identities synchronized with your CDP.